Definition at line 3146 of file DeclCXX.h. Definition at line 3190 of file DeclCXX.h. Definition at line 3189 of file DeclCXX.h. Definition at line 2678 of file DeclCXX.cpp. Definition at line 2688 of file DeclCXX.cpp. Definition at line 3231 of file DeclCXX.h. Definition at line 3232 of file DeclCXX.h. Definition at line 3181 of file DeclCXX.h. Definition at line 2693 of file DeclCXX.cpp. Definition at line 3199 of file DeclCXX.h. Definition at line 3202 of file DeclCXX.h. 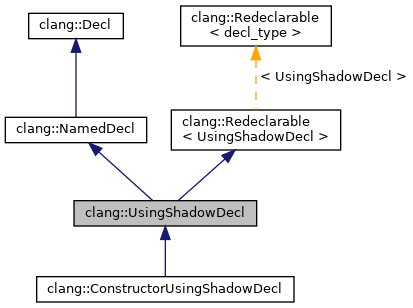 The next using shadow declaration contained in the shadow decl chain of the using declaration which introduced this decl. Definition at line 3227 of file DeclCXX.h. Gets the underlying declaration which has been brought into the local scope. Definition at line 3208 of file DeclCXX.h. Referenced by clang::Sema::InheritedConstructorInfo::InheritedConstructorInfo(), clang::TextNodeDumper::VisitConstructorUsingShadowDecl(), clang::ASTDeclWriter::VisitUsingShadowDecl(), and clang::TextNodeDumper::VisitUsingShadowDecl(). Gets the using declaration to which this declaration is tied. Definition at line 2697 of file DeclCXX.cpp. Referenced by clang::ConstructorUsingShadowDecl::getNominatedBaseClass(), and clang::Sema::HideUsingShadowDecl(). Sets the underlying declaration which has been brought into the local scope. Definition at line 3212 of file DeclCXX.h. Definition at line 3178 of file DeclCXX.h. Definition at line 3179 of file DeclCXX.h. Definition at line 3147 of file DeclCXX.h. Referenced by clang::UsingDecl::Create(), and clang::UsingDecl::CreateDeserialized().